Following the “15th July 2016 coup attempt”, the AKP government sacked tens of thousands of civil servants, including over eight thousand Turkish academics with many influential critics amongst them. The governmental decrees issued by the Turkish government resulted in dozens of universities and academic departments to close – leaving many students without lecturers and many research projects funded by the state to end abruptly. Consequently, the large-scale dismissal of academics has had direct effects on the research outputs of Turkey-based academics. In this study, we identified a significant reduction (11.5% on average) in the research output of Turkey-based academics in 2017 compared to 2016. When the average increase of 6.7% per year observed in the research output of Turkey-based academics between 2008 and 2015 is taken into account, this translates to a decrease of over 7,000 papers than the expected figure in 2017. We also identified substantial decreases in the research outputs of some of Turkey’s top universities such as Bilkent (-9%), Hacettepe (-11%) and Gazi (-20%) in 2017 compared to 2016. Both Süleyman Demirel University and Pamukkale University, which lost nearly 200 academics each to governmental decrees issued by the AKP government, showed nearly a 30% decrease in 2017 compared to 2016. The long-term effects of the draconian measures taken by the AKP government on Turkey-based research and academia remains to be seen. Click to download full report: FfA Annual Report 2017. Click to download full report (updated: 03/03/18): Print Friendly version. Since the “15th July 2016 coup attempt”, the AKP government sacked over eight thousand academics, mainly targeting influential critics. This resulted in many universities and academic departments to close – leaving many students without lecturers, many hospitals to be left with a lack of key personnel, and many scientific projects funded by the state to come to an abrupt end. Consequently, the large-scale dismissal of academics has had short-term effects on the research outputs of Turkey-based academics. In this study, we identified a significant reduction (~28% on average) in the research output of Turkey-based academics in 2017, regardless of academic field. The long-term effects of the draconian measures taken by the AKP government on Turkey-based research and academia remains to be seen. In the aftermath of the “15th July 2016 coup attempt”, the AKP government wasted no time in using this as an excuse to suppress all dissent. Within days, over nine thousand civil servants (of all backgrounds, from teachers to police), and many media outlets and universities were closed with a single decree (decree no. 667, issued on 23rd July 2016). All those purged lost their right to work in any public institution and had their passports cancelled – thus could not travel abroad to find work. Most of those purged were either imprisoned and/or detained for at least a certain amount of time (see Turkeypurge.com for comprehensive statistics). Some have even had their assets seized and/or bank accounts frozen. Gross human rights violations were reported, with concrete evidence for physical, psychological, and emotional torture in prisons (Amnesty Report on Turkey 2016/2017). However, since these are outside the scope of this article, please refer to websites/reports which extensively monitor these violations for more information (e.g. Amnesty Report on Turkey 2016/2017, Turkeypurge.com). Decree no. 667 was followed by many other decrees, each time adding substantially to the total of dismissed civil servants. However, academics were largely untouched (with regards to dismissals by a decree) until decree no. 672 (issued on the 1st September 2016), where over two thousand academics were purged in one go. This decree was followed by numerous decrees, where, as of 15th May 2017, the total number of purged academics reached over eight thousand. Apart from the universities that have been shut down entirely (Scholars At Risk, 2016), these large-scale purges have led to many academic departments to close (leaving many students without lecturers), many hospitals left with a lack of key personnel (as many medical academics were also serving part-time), and many projects funded by the state to come to an abrupt end. Consequently, these changes have had negative psychological, emotional, and social effects on the population, but also had an impact on the research output of Turkey-based academics. Filtering on (i) Affiliation country (as Turkey), (ii) Publication year of articles (as 2016 and 2017, separately), and (iii) Document types (as Article, Review, Article in Press and Letters) and (iv) Subject area (as ‘Medicine’, ‘Engineering’, ‘Physics and Astronomy’, ‘Biochemistry, Genetics and Molecular Biology’, ‘Materials Science’, ‘Mathematics’, ‘Social Sciences’, ‘Pharmacology, Toxicology and Pharmaceutics’, ‘Computer Science’, ‘Agricultural & Biological Sciences’, ‘Earth and Planetary Sciences’, ‘Economics, Econometrics & Finance’, ‘Chemistry’, and ‘All areas’, separately), we identified that there was a significant decrease (~28% on average) in the number of research outputs of Turkey-based academics in 2017, regardless of the academic field (Table 1). The most affected fields were the Social Sciences, and Medicine, with a total reduction of 44% and 36% in the number of published articles by Turkey-based academics, respectively. This sharp decline in the research output in 2017 compared to 2016 becomes more striking when 2012, 2013, 2014 and 2015 figures are brought into the equation, as a stable upward trend in the research output of Turkey-based academics was observed in this time period (excluding 2017) – with, on average, ~5% more articles being published compared to the previous year, every year, across all fields (Figure 1). Turkey, before the purges, had approx. 150,000 academics, including ~22,000 Professors, ~14,500 Associate Professors and ~34,000 Assistant Professors – with the remainder being (part-time or full-time) teaching or research assistants (YÖK istatistikleri, 2016). With a series of decrees, the AKP government purged (as of 15th May 2017) around 8,300 academics, which is a considerable proportion of the total (~6%). Considering that the AKP government mainly targeted influential critics including prominent academics such as 82-year-old Prof. Öget Öktem-Tanör (Neuropsychology), Prof. Sedat Laçiner (Political Sciences), Prof. Mehmet Altan (Economics), Prof. İbrahim Kaboğlu (Constitutional Law), Prof. A. Özdemir Aktan (General Surgery), Prof. Melek Göregenli (Social Psychology), Prof. Ayşe Gül Yılgör (Economics and Administration), Prof. Haluk A. Savaş (Psychotherapy) and Prof. Ayşegül Jale Saraç (Physiotherapy), this figure is likely to be an underestimate within the more senior positions (i.e. above and including Assistant Professors). The significant decrease (~28% on average) in the research outputs of Turkey-based academics is not totally explained by the proportion of the sacked academics (i.e. ~6%). The discrepancy is likely to be due to a combination of factors: (i) the sacked, on average, may have been more productive in publishing articles than the remaining ones; (ii) the psychological stresses that the remaining academics are facing (e.g. research has become secondary, fear of publishing controversial/critical articles, not being able to concentrate due to frequent ‘breaking news’); (iii) sudden cuts in funding to some departments and/or many projects being cancelled, and (iv) a significant number of academics who had the capacity (e.g. already established or with promising CVs) may have already left the country and found a job abroad prior to 2017 – although they were not sacked by a decree. Further research is required in this regard. As not enough time has passed since these purges to carry out comprehensive longitudinal studies, we can only analyse the short-term effects of the large-scale dismissals. However, it is conceivable that the long-term effects may be more catastrophic for Turkey-based research and science because many academics who have not been sacked still fear for their jobs (and imprisonment, as mentioned above, many who have been sacked are in prison) as many of them are being monitored by overzealous university rectors and deans (from personal communication). Carrying out research has therefore become secondary to numerous academics, and many who have the capacity (e.g. already established or with promising CVs) are looking for jobs abroad; and this is bound to lead to a ‘brain drain’, detrimental to the country’s higher education and science systems. We have taken the decree no. 672 as a reference point and added three months to it as it is reasonable to assume previously submitted papers (i.e. prior to 1st September 2016) will have been published by then. Thus, we have compared the research outputs of Turkey-based academics from 1st January 2016 to 31st December 2016 with the research outputs of Turkey-based academics from 1st January 2017 to the present date (i.e. 31st May 2017). We have then extrapolated from the 6-month mark (i.e. 31st May 2017 figures) by multiplying the resulting figures by two to calculate the (extrapolated) 2017 figures. To bring some background context into the trends, we also carried out the same analysis for articles published in 2012, 2013, 2014 and 2015 (NB: for clarity, we included only the latter two in Table 1, although Figure 1 makes use of all years’ figures). Since we calculated the 2017 figure by extrapolating from the 31st May 2017 figures, we assumed that the research outputs in the first six months of 2017 will not differ significantly from the latter 6 months. To check the validity of this assumption, we analysed a subset of the 2016 articles (i.e. articles for which we could reliably set a publication month for, using the ‘PUBDATETXT’ feature of SCOPUS), we found that the differences between the number of articles published between 1st January and 31st May 2016, and between 1st June and 31st December 2016 were not significant; and provided no evidence in explaining the substantial decrease observed in the (extrapolated) figure of 2017 in relation to the 2016 figure (articles published between 1st January and 31st May 2016, n=14,033; 1st July to 31st December 2016, n=14,638; t-test P value> 0.20). Judging by the recent decreasing trend observed until now, we have probably overestimated the 2017 figures as a more comprehensive extrapolation method would have yielded much smaller figures for 2017. Follow-up studies will be carried out in early 2018 and further dates to confirm the conclusions of this report. We realise that not all of the subject areas used in this study are independent (e.g. there is a ~40% overlap between the articles in the ‘Pharmacology, Toxicology and Pharmaceutics’ category with articles in the ‘Medicine’ category), thus the decrease in one field may have affected the results in a related area (these have been indicated in Table 1). However, the absolute value of articles published within each academic field are not the main interests of this study (but rather the relative values), therefore any confounding effects in the absolute value of certain academic fields should not take anything from the validity of the conclusions. A large decrease in the research output of Turkey-based academics was observed in all fields. We mostly relied on SCOPUS to define the subject area of an article as we do not have the capacity to examine each article to place them into the most fitting categories. However, after validating a number of the articles, we believe that SCOPUS has done a good job in this regard. We did not take into account the quality of the research published, as we assumed that the overall impacts of the studies published by Turkey-based academics in 2016, and in 2017 should not be too different. A significant difference is not expected in time periods that are this close (e.g. this assumption may have been violated if we were comparing the 1970s research outputs with today). We also do not take into account the significance of the Turkey affiliated academic in the papers published (e.g. first/equal-first/senior authorship should be weighted higher than a mid-authorship; and there is a lot of variability between mid-authors, which is very hard to quantify). However, we do not think the overall contribution of Turkey-based co-authors would change significantly between 2016, and 2017. The publication date of an article may not consistently correspond to the acceptance date of a manuscript as certain journals take longer to process an ‘accepted’ manuscript and publish. Again, this may affect the absolute values but should not affect the relative values significantly between time-periods that are this close, supported by the stable numbers in the ‘All articles’ category in Figure 1. 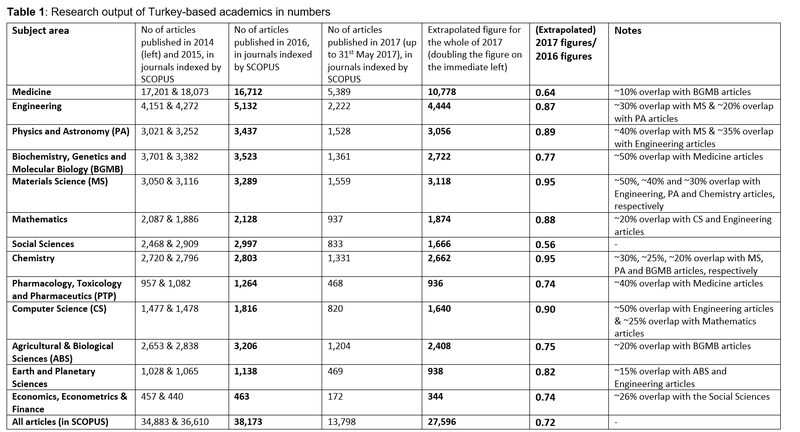 SCOPUS does not index all existing journals (although, virtually all international journals with a decent impact factor are indexed); thus, the absolute values of the research-output of Turkey-based researchers will be underestimated. However, this should not considerably affect the relative values as this underestimation should be consistent across the time-periods studied. Follow-up studies can make use of several databases (e.g. Web of Science, Crossref, Google Scholar) to garner evidence from a variety of sources. We assumed that the number of research-productive academics did not change significantly between 2016 and 2017. This may have biased the 2017 figures up or down (e.g. sizeable number of prominent academics may have immigrated/emigrated prior to 2017), thus further study is required. However, analysing the 2012, 2013, 2014 and 2015 figures suggest a stable upward trend was observed in all areas (prior to 2017), thus making it more apparent that 2017 was not a successful year for Turkey-based academics overall – at least in terms of research output. Amnesty Report on Turkey 2016/2017: https://www.amnesty.org/en/countries/europe-and-central-asia/turkey/report-turkey/, accessed 18th May 2017. Amnesty Report (EUR 44/6272/2017) on Turkey: https://www.amnesty.org/en/documents/eur44/6272/2017/en/, accessed 22nd May 2017. Scholars At Risk: https://www.scholarsatrisk.org/2016/07/15-universities-shut-connection-state-emergency/, accessed 24th May 2017. SCOPUS: https://www.scopus.com/home.uri, accessed 31st May 2017. Turkey Purge: https://turkeypurge.com/, accessed 18th May 2017. YÖK (Turkish Council of Higher Education) statistics: https://istatistik.yok.gov.tr/, accessed 18th May 2017. We believe that all academics deserve an environment where they are free to think, write and speak critically without fearing for their job and freedom, let alone their lives. Unfortunately, many academics who resist their government’s attempts to silence thought and speech are facing adversity in many countries. Recently, Turkey has been under the spotlight with the sacking of over 8,000 academics for vague and unsubstantiated allegations. We are a group of British and Turkish academics/researchers who are willing to lend a helping hand to our colleagues and bring these injustices to the attention of the public and academic circles. We also aim to liaise and cooperate with other groups believing in similar principles and help them help other persecuted academics. For more information about us, please visit our website: http://www.freedomforacademia.org/. AKP hükümeti “15 Temmuz 2016 darbe girişimi”nden sonra KHK’larla 8 bini aşkın akademisyeni işinden etti. Bu akademisyenlerin arasında Prof. Dr. Öget Öktem-Tanör (Nöropsikoloji), Prof. Dr. Sedat Laçiner (Siyaset Bilimi), Prof. Dr. Mehmet Altan (Ekonomi), Prof. Dr. İbrahim Kaboğlu (Anayasa Hukuku), Prof. Dr. A. Özdemir Aktan (Genel Cerrahi), Prof. Dr. Melek Göregenli (Sosyal Psikoloji), Prof. Dr. Ayşe Gül Yılgör (Iktisadi ve Idari bilimler), Prof. Dr. Haluk A. Savaş (Psikoterapi) ve Prof. Dr. Ayşegül Jale Saraç (Fizik tedavi ve Rehabilitasyon) gibi kendi bilim dallarında saygınlık kazanmış bilim insanları da yer alıyor. Akademik camiaya yapılan bu kıyım, toplam akademisyenlerin 6%’sı gibi önemli bir orana tekabül ediyor. Freedom for Academia olarak yayınladığımız bu kısa raporda, Türkiye’nin akademik ve bilimsel araştırmalarına bu 6%’lık oranın açıklayabileceğinden çok daha ciddi bir darbe vurulduğunu tespit ettik. Akademisyenler KHK’lar ile işten atılmaya başlandıktan sonra Turkiye’deki bilim adamları tarafından yayınlanan makalelerde 30%’a yakın bir düşüş oldugu görülüyor. AKP hükümetinin yaptığı akademisyen ve araştırmacı kıyımının uzun vadede Türkiye bilimine vereceği zararlar ise şüphesiz daha ileri tarihlerde yapılacak araştırmalar ile daha net bir şekilde ortaya çıkartılacaktır. Table 1 shows the absolute number of peer-reviewed articles published in journals indexed by SCOPUS (i) between 1st January 2016 and 31st December 2016 and (ii) between 1st January 2017 and 31st May 2017. The latter figure was then multiplied by two to calculate a figure for the whole of 2017. Research output in the Social Sciences and Medicine appear to have been affected the most with a decrease of 44% and 36%, respectively, in relation to 2016. 2014 and 2015 figures are included for background information. Many of the academic fields listed here are not independent of each other and this has been noted in the Notes column. 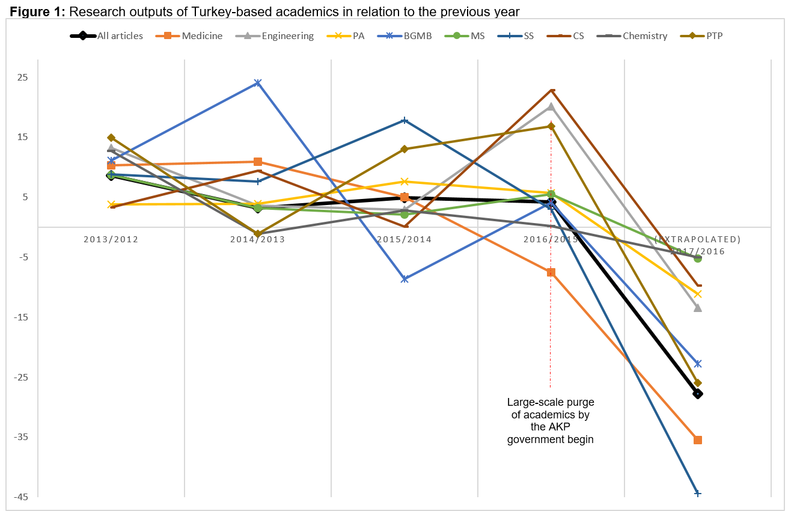 Figure 1 shows the change in research output of Turkey-based academics compared to the previous year (in percentage) on the y-axis; and the two years compared are on the x-axis. For example, there was a ~8% increase in the research output of Turkey-based academics in all areas (thick black line) in 2013 (covering period 1st January 2013 to 31st December 2013) compared to the year 2012; and then a continuous ~4% increase until 2017, where an approx. 28% decrease is observed compared to the 2016 research outputs. PA: Physics & Astronomy, BGMB: Biochemistry, Genetics and Molecular Biology, MS: Material Science, SS: Social Science, CS: Computer Science, PTP: Pharmacology, Toxicology and Pharmaceutics.